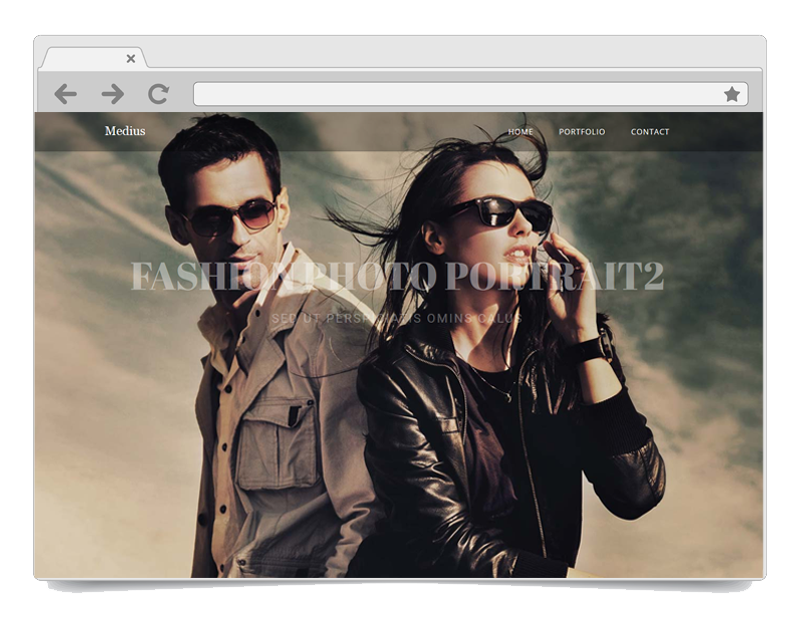 Our powerful drag & drop templates help you convert visitors into customers. It’s the way that WordPress should have been initially. Kudos man, but I think ur ahead of your time. I’ve been looking through all your material since I bought the theme and lemme tell you something – NOBODY out there offers what you are offering! You should charge TRIPLE because it’s an SEO course as well. I love this theme. Its about time an SEO pro put together a theme. Long overdue. Silo builder saves so much time, new sites are a breeze with this tool. Being able to customize each page is awesome the list goes on and on. The SEO Design Framework is a beautiful, responsive, premium WordPress theme designed with powerful SEO functionality at its core. Use this framework to create limitless design combinations on unlimited sites (with a single license). Rock-solid code and smooth site architecture are yours within a few clicks. Great SEO starts with proper site architecture. Now you can easily create perfectly silo’d websites in minutes. Just add your keywords into your silo (primary topic) then add your sub categories and supporting articles and and the framework does all the dynamic linking (by topic) for you. Yes, I Want the Silo Builder! 3 Part Website Silo Architecture Training Course Included in Member’s Area. Why use 20 Plugins for SEO, When You Can Do Everything with Just One? Join over 250,000 webmasters using our SEO technology for WordPress to rank higher in search engines. Now you can easily mass edit meta data, automate internal linking, optimize for local search and instantly add schema markup, Open Graph and more using SEO Ultimate’s integrated functionality. Yes, I Want Powerful SEO! Once you have traffic, you must convert it into sales. Now you can instantly create beautiful layouts for your WordPress theme with drag and drop ease. Even if you’re not a designer, don’t know CSS or HTML? 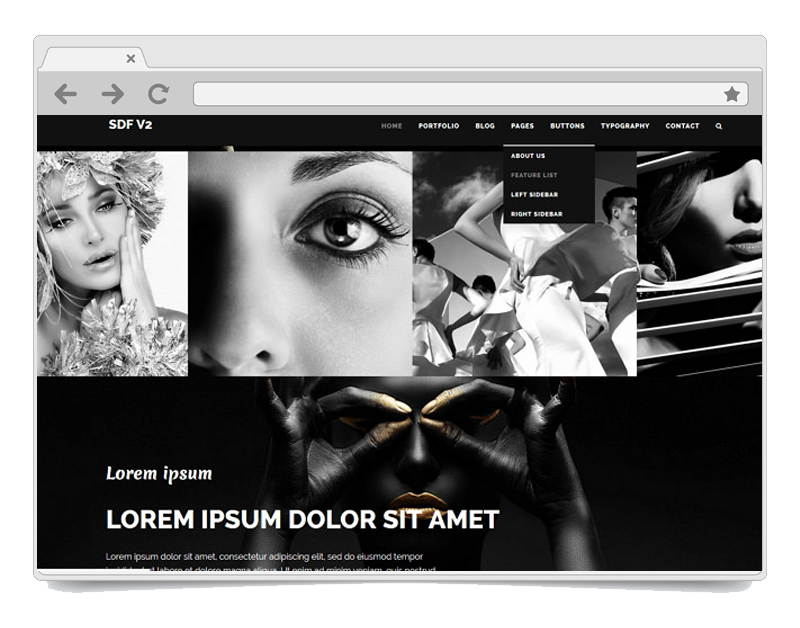 You can create modern, beautiful layouts using the SDF Page Builder. Yes, I Want Drag and Drop Design! 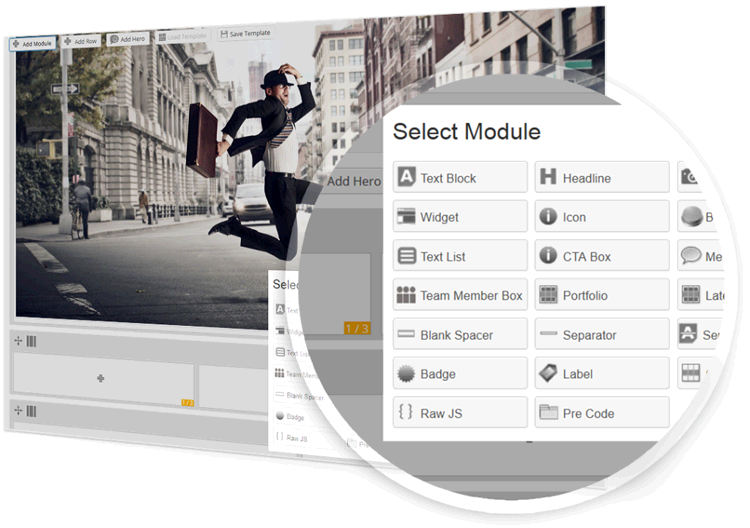 Create Complex Designs with Ease with the Drag and Drop Page Builder. It’s Everything You Need to Build Websites That Rank! Mobile-ready responsive layouts resize to fit on any device. Whether you’re creating a professional website for your business, stunning landing pages to increase sales, a popular blog for yourself or custom designs for clients, the SEO Design Framework is completely optimized for mobile with built-in responsive design, works seamlessly with WordPress plugins and features a simple, easy-to-use drag and drop page builder that allows you to create premium, custom designs with ease. Also, just in case you get stuck, there’s lightning fast support and detailed online documentation as well as access to advanced SEO training inside to help you improve search engine rankings. We’ve even got you covered in social media, the SEO Ultimate plugin even features awesome tools like Open Graph to help you stand out in social networks like Facebook, Twitter, Google Plus, LinkedIn and others. Installation and setup are easy (just like any ordinary WP theme) you simply upload the framework and inside the dashboard you can customize your WordPress theme with ease including navigation, typography, layout, color schemes, header, footer and content and widget areas. It even includes the popular Revolution Slider to add custom slides to your pages with ease. Get the Framework. Get Trained. Get Ranked. Get the SEO Design Framework for WordPress, all 30 SDF Themes and advanced SEO training in the member’s area for only $49 (for a limited-time). Order now today. We’ve created a step-by-step video tutorial that includes everything you need to know to build perfect website silo architecture from the ground up. Siloing your content is giving search engines exactly what they want. Content within the same silo only links to itself and back up to the parent theme. This creates a type of powerful internal-linking that creates ideal on page architecture. Doing this manually is a painstaking process, but now, with the Silo Builder, you can save time, enhance usability, increase indexation and let your pages rank themselves as a result of properly structured site architecture. Just add content. 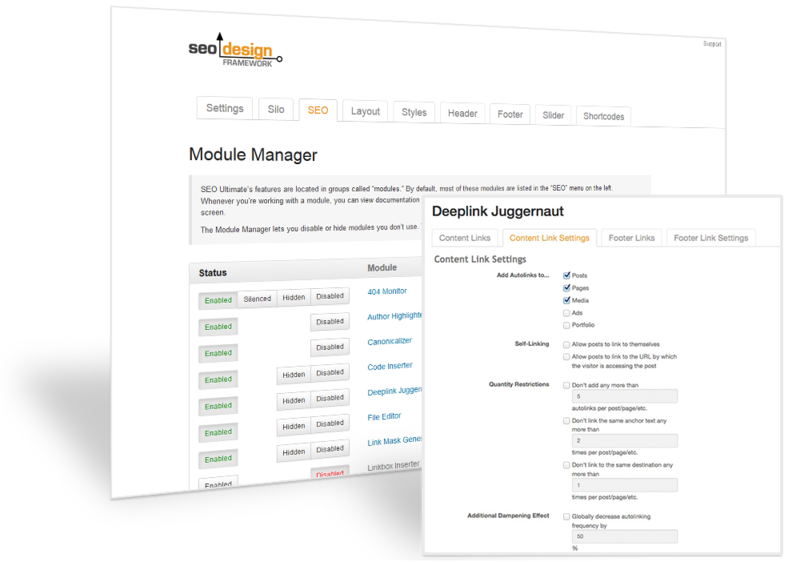 We’re giving you exclusive access SEO Ultimate and previously unreleased rare SEO tools inside our framework. It’s the secret technology our agency packed into our top clients SEO campaigns. These features were built, battle-tested and refined over 7 years based on real-world competition, algorithm updates and ongoing campaigns to capture competitive keywords. 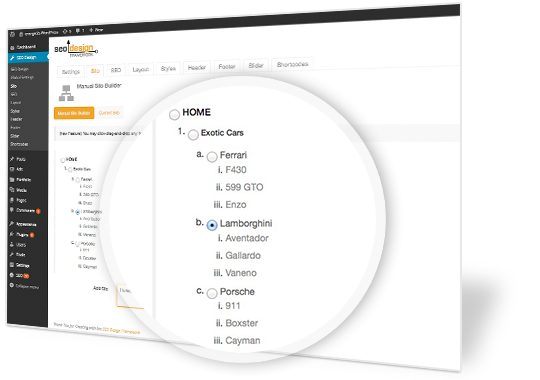 Need customization on a page by page basis? No problem. Create custom layouts, turn the page title or breadcrumbs on or off, add background video, or select an entirely different look and feel on a page-by-page basis. The SEO Design Framework features global header controls as well as individual page level header settings that allow you to customize each page independently. Go ahead… Take a look for yourself.